In the previous posts in this series we’ve been looking at how to work with Vagrant and WordPress and how to automate setup work using Grunt and WP-CLI. In this posts, we’ll look a little bit on how we can transfer various settings between the WordPress database and into text files in the source code tree. Because as soon as we have the settings in files, we can easily transfer those settings to a target system such as a staging environment or the live site. There’s a Git repository available with code for this post here: https://github.com/eriktorsner/wpconfigurationmanagement I suggest you clone or download the code to your development computer to make it easier to follow along. 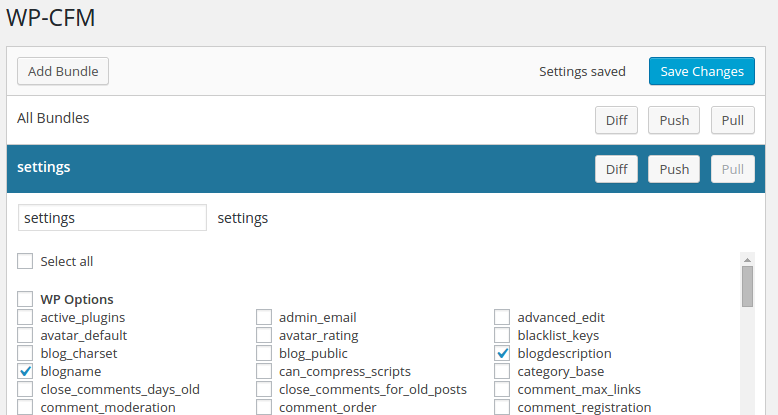 A Setting is any of the small or large things you change in the Settings menu in the WordPress admin area. The number of blog posts shown on the first page is a setting and so is the site title and the default date format. WordPress uses the database to store settings into a table named wp_options (at least as long as you are using the standard wp_ prefix). Most of the settings that a core WordPress installation will put into the wp_options table are simple scalar values, a string or a numeric value. But some of the settings consists of larger more complex structs like an array or even arrays containing objects containing arrays. The internal WordPress code makes sure that pretty much anything you can represent in a PHP variable can be stored as a setting. If needed, WordPress uses the native PHP function serialize() to convert any given variable to a text representation suitable for database storage and then unserialize() to convert it back when needed. This repo uses an evolved version of the Vagrantfile. Only the rows you need to change are present, everything else is moved in to a file in the vagrant/ sub folder. No need to change anytning inside the vagrant/ sub folder, everything it’s taken care of during provisioning. We’re going to talk about two different approaches for managing settings in a text file. The first approach is using Gruntfile.js itself, the other approach uses the free plugin WP-CFM. The most straight forward way would be to use Gruntfile and Wp-cli. The settings themselves will be in the form of Wp-cli statements that will be automatically inserted into the target WordPress installation when the Grunt task wp-setup is executed. The three highlighted rows will update the Site title (blogname), the tag line (blogdescription) and the ‘Blog pages show at most’ setting (posts_per_page) that are found in WordPress Admin. This is a very manual form of serializing settings to disk and it’s easy to get started with. If you only have a few of them that you need to set, this approach will work but it has a few downsides. Obviously, the manual work involved in writing the wp-cli statements in your Grunt file is not very optimal. Easy to forget individual settings, easy to lose the overview etc. The other downside is that changes you make in WordPress admin has no way of automatically find their way into the Gruntfile. You’re in for a lot of manual work. But there is another way. WP-CFM is a free plugin available in the WordPress plugin repository. It’s name stands for WordPress Configuration Management and it does exactly that: Configuration Management. WP-CFM uses a concept call bundels. A bundle is a group of individual WordPress settings. WP-CFM can Push a bundle to file, meaning that it will read the value of each of the settings in the bundle from the database and store them in a file. And later, WP-CFM can Pull that file back in and restore those values in the database. As you can see, WP-CFM uses a JSON file to store the individual values and stores the file in a predictable location. For fun, we can change the “blogname” setting inside this file and try the Pull button (you probably will need to reload the page for the Pull button to become active). Once the updated settings has been pulled into the database and you’ve reloaded the page, you should see that whatever value you selected for “blogname” now is in the page title. Since the WP-CFM plugin was build for automation from the start, our work is reduced to managing the settings file so that we can keep in under source code control. With these two Grunt tasks, we’ve now automated the process for storing WordPress settings in the source code control system. Some settings contains references to a page, a post or a menu item using the internal database id and the database ID might differ between the development version and the production version. These two issues as well as the challenge of moving actual content (pages, images etc) from development to production is going to be covered in future posts in this series. So stay tuned!